How Do Bay Leaves Repel Bugs? Bay leaves are a popular ingredient in spaghetti sauces and soups, but they can also be used as a natural way to repel insects. Dried bay leaves, when sprinkled around your home, can be just as effective in warding off nuisance insects, like cockroaches, ants and fleas, as can some of the most popular commercial insecticide sprays. The best thing about using bay leaves instead of commercial insect killers is that there are no toxins involved -- they are safe for use in homes where children and pets are present. Try using bay leaves as a natural pest repellent. Several herbs and spices can be used as natural pest repellents, including bay leaves. It is not clear why bay leaves are effective in this way, but it is common opinion that the pungent scent of bay leaves is what deters pests. Other herbs and spices, like garlic, mint and citrus, are effective pest repellents because insects do not like their smells, and it is believed that the same principle applies to bay leaves. It is also possible that myrcene and eugenol, the essential oils commonly extracted from bay leaves, may play a role in deterring pests. Bay leaves are a common herb that can be purchased in dried, whole-leaf form at most grocery stores. To use bay leaves to repel insects, place whole leaves in the areas where you most often spot pests. Place bay leaves on counter tops, under cabinets and appliances, around trash cans and along baseboards. After a few days, the pungent odor of the bay leaves may wear off and lose its efficacy, so you will need to replace the leaves about once a week to maintain effective insect control. 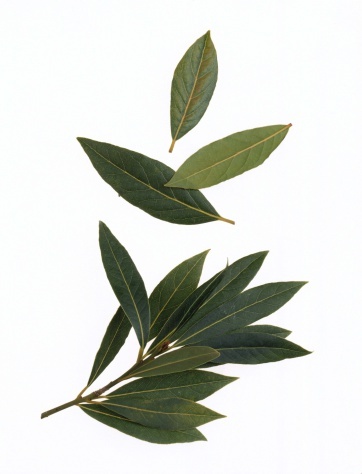 Bay leaves are commonly touted as effective in repelling large insects like cockroaches, as well as fleas and flying insects like wasps and flies. Sugar ants, one of the most common household pest, can also be repelled by sprinkling bay leaves in feeding areas and near the cracks and crevices insects use to enter the home. Though the effectiveness of bay leaves as an insect repellent has been tested against these bugs, bay leaves also may work for other types of household pests, including spiders and moths. Because it is the pungent odor of bay leaves which repels insects, it should come as no surprise that other strong-smelling herbs and spices are also effective in deterring insects. Garlic, cucumber peels, cayenne pepper and mint are some of the most frequent all-natural pest repellents recommended for in-home use, though lemon, basil and essential oils have also been known to work. In the garden, herbs and grasses like lemon grass, citronella grass and mint can be planted to repel bugs, and they work in much of the same way that bay leaves do at repelling indoor insects.